Add orchids, known to symbolize love, luxury, and strength, to your wedding bouquet for a delicate and exotic touch. Available in wide varieties, orchids offer various color options and textural feels. Whether it's the soft, sumptuous phalaenopsis orchid or the dancingly, playful oncidium orchid, there is an orchid that will suit your overall vision. 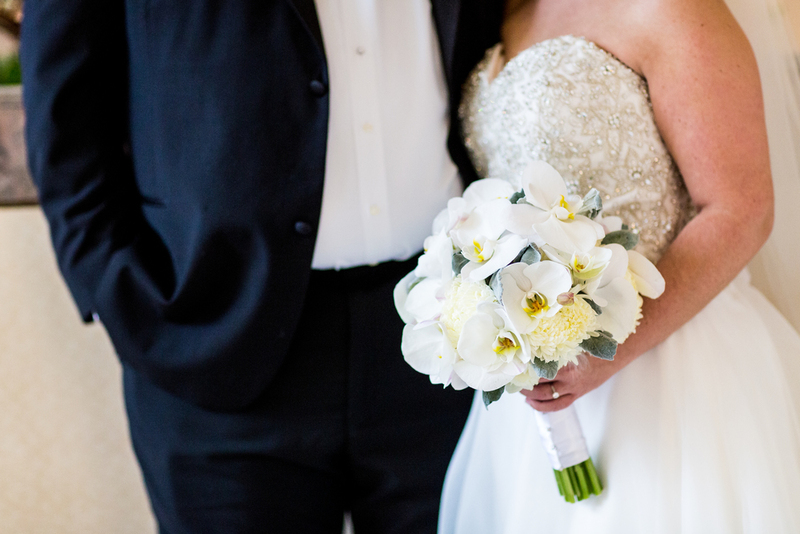 This elegant look features a bridal bouquet of all phalaenopsis orchids. The orchids are gathered in their natural state, draping organically down. Simple and elegant, this look is beautiful for any bride. With its rich orange color, this mokara orchid pairs beautifully with a mix of red blossoms for a contemporary color splash. Deep roses and bright red gomphrena blend to make a texturally sophisticated bouquet. These bridesmaids bouquets balance the perfect textural blend of blossoms to create a rustic farm look. 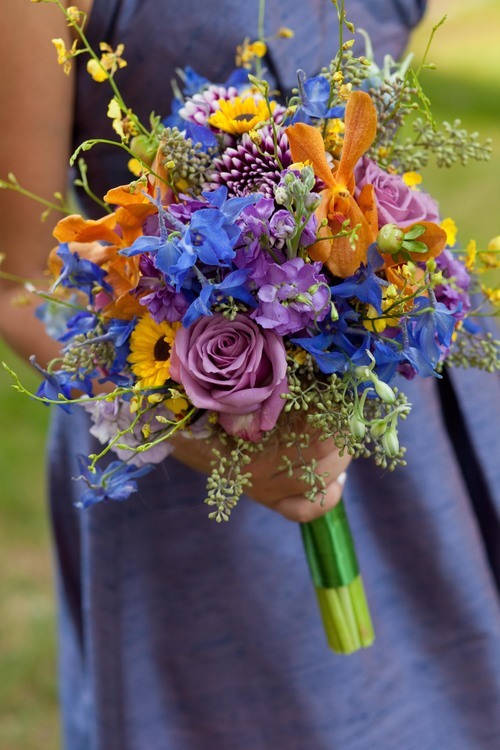 Orange Mokara orchids blend well with lavender roses and blue delphinium, while bright pops of deliciously yellow oncidium orchids give textural height to the overall bouquet. These richly white phalaenopsis orchids are a popular choice for bridal bouquets. Unlike our first bouquet with loose and natural shape, this bouquet has a more structural feel that is just as stunning. Blended with football mums and dusty miller these orchids add just the right amount of softness to the bouquet. Tucked into these blossom-packed bridesmaid bouquets are rich jade green dendrobium orchids. They offer beautiful color with their green petals and ruby cores. A truly stunning mix of flowers. Who can argue the stunning color of a magenta cattleya orchid? Their delicately ruffled texture is perfect against the hearty red roses in this bouquet. Colorful, yet elegant. The subtle touches of cymbidium blossoms in this bridal bouquet provide added texture and soft cream color. Blended with roses and ranunculus, the orchids are a delicate addition. Did someone say purple? 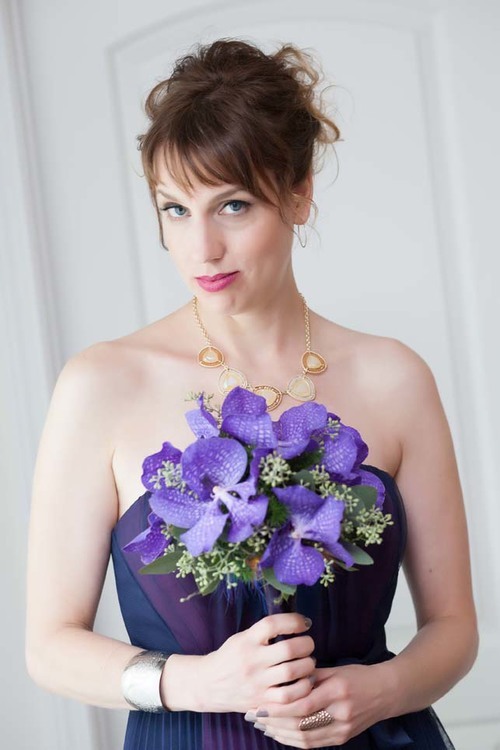 These vanda orchids are the perfect pop of color for this bride's monochromatic visions. Richly purple and full of soft texture these vandas are the star of the show. This gorgeous bouquet is freshly green and textural. The balance of green cymbidium orchids with other green elements like fern tips and veronica balance beautifully with white phalaenopsis blossoms and white lisianthus. 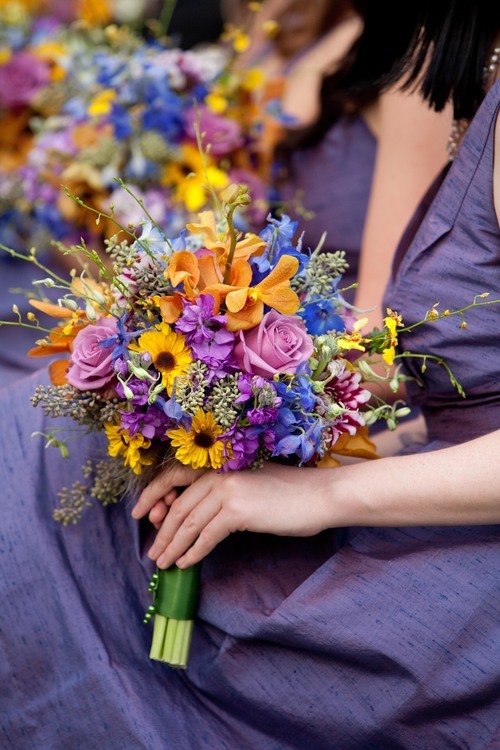 Purple and orange are analogous colors and make a beautiful combination in this featured bridesmaid bouquet. Roses, hydrangea, calla lilies, and dendrobium orchids mix various shades of purple while pops of orange mokara orchids give hints of light throughout the bouquet.